Great news! A brand new low-carb store has opened in beautiful Mill Creek, Washington. Owners Dan Arnold and his wife, Amber Wester, invite you to join them for a grand opening celebration this coming Saturday, February 6th. (See invitation below.) I will certainly be there to wish them well and to stock up on all my favorite products that, I am thrilled to say, I can now buy locally! If you live in the Seattle area (Eastside), I hope you will support Dan and Amber in their effort to have a positive impact in our community and to spread the word that there is a smarter way to eat. If you don’t live nearby, take heart, this may be the vanguard of a new trend toward a more healthful lifestyle that will eventually spread across the country. Please stop by on Saturday February 6th anytime between 10:00 AM & 8:00 PM to celebrate the opening of Smart Eats! We will have lots of products available to sample and many items on sale so please stop on by. If you know someone who has a need for Diabetic, Low Carb or Gluten Free products please forward this message to them. Thanks! 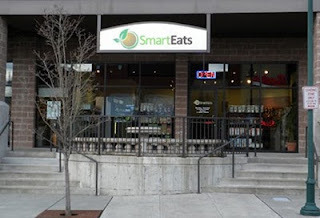 Smart Eats Store in Mill Creek. Bookmark. i wish i could go!!! Come back and tell us what you bought!!! I will definitely be going there at some point.